Recipe and then a few thoughts for ya’ today. OK. So first a recipe (and yes, I’ve posted it before. Get off my back! This is a reminder for you, K?) Rather than the dish of warm, cooked carrots that I have personally never been a fan of :(, consider this gorgeous, carrot slaw as an alternative! Not only will it be gobble-gobbled up in a jiffy, it can be prepared one or two days in advance. In fact, it tastes better when prepared in advance. So, like, you might want to prepare it in advance. I’m just sayin’. Bake walnuts at 350 for about 5-7 minutes. Set aside. Throw remaining ingredients into a bowl and toss it up a bit. 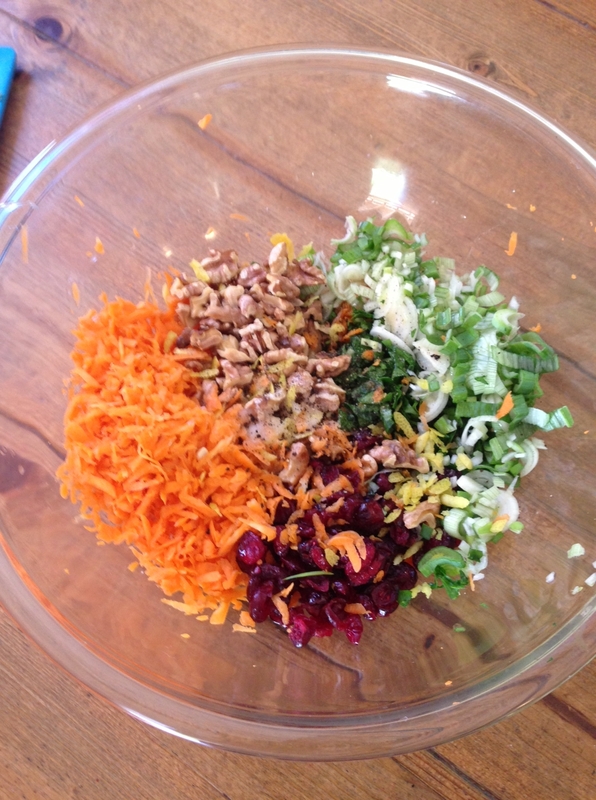 This salad will keep well in the fridge for a few days, but don’t add the walnuts until you’re ready to eat. And now for those thoughts I mentioned. I L-O-V-E Thanksgiving. Since food, family and friends are my favorite things in the whole universe, this coming Thursday is tailor made for moi. No shopping for gifts, decorations can be minimal or maximal, depending on your mood, and then you just gather with a bunch of people you love (or have to tolerate for a few hours, whatever) and eat delicious food. OK. Yes. And drink wine. Ahhh…. A note on my pot-luck notion. I take pot-lucks very seriously. There will be 35 people at my house (Please don’t rain! Please! Please! Please!) this year for Thanksgiving and there ain’t no way I’m making all the food. And why should I? My grandma always said, “If you want to make someone feel like family, they have to contribute something.” I’m making the turkey and this carrot slaw. My guests are bringing dressing, potatoes, multiple vegetables, sweet potatoes, wine, pies, everything we need, really, for this to work. I don’t just assign ornamental after-thoughts like dinner rolls to my guests (now the guy who’s bringing dinner rolls is scratching his head… It’s OK. He’s bringing other things too.) On Thursday ALL my guests are family and I’m counting on them to not blow it. I’m not worried. They always rise to the occasion. That’s what loving families do. Final words: save your turkey carcass! My family’s post-Thanksgiving tradition is turkey tortilla soup… which I will not be thinking about yet on Thursday. I simply cannot call this salad “carrot slaw.” “Gorgeous” must be in the title because, duh: it is so divine to look at! I placed that blue vase (pronounced “vahs” for effect) in the background as it makes such a stylish contrast. I am so artsy-shmartsy. 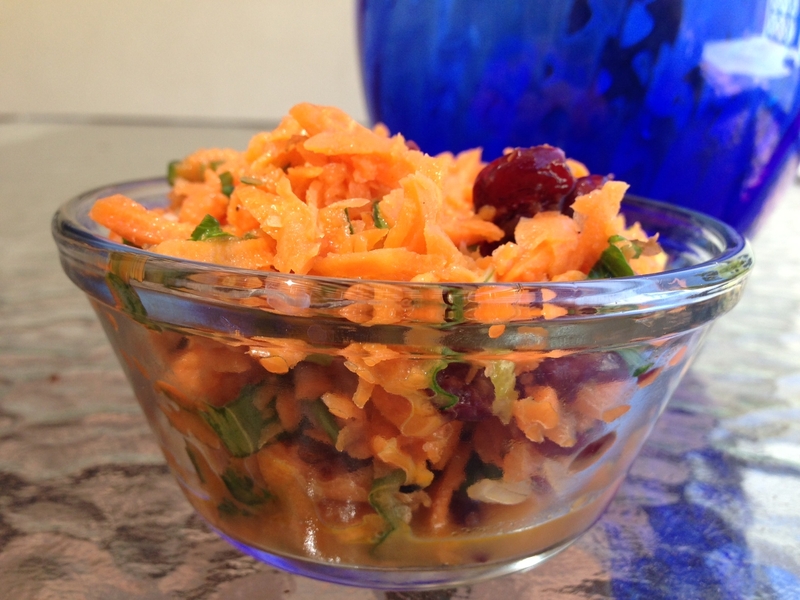 My carrots slaw recipe is tweaked and a bit simplified from Once Upon a Chef. I eased up on a few ingredients but it could be because the farmers market carrots I get don’t need as much stuff on’em; I don’t know. Here’s what all the yummy stuff looked like before I mixed it up. It’s already getting pretty! I went ahead and and tossed my walnuts in as our mouths were beginning to water at this point and I was fairly certain the salad wouldn’t last long. I was right. I made my gorgeous carrot slaw for a potluck last night with a few bags of store-bought shredded carrots. 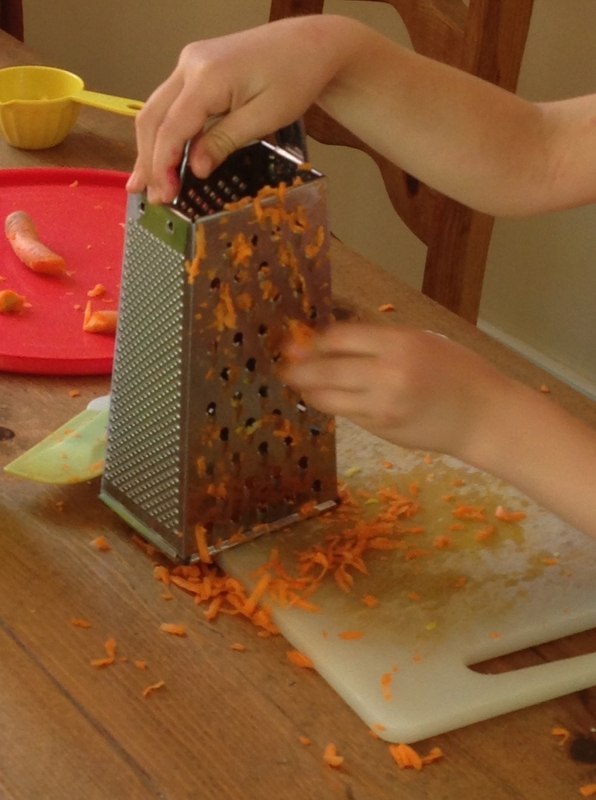 Much less work and a different texture than the hand grated method. What made it still yummalicious was that I made the salad 24 hours in advance so the flavors had time to really get to know each other. They got along great, btw.